Lyle Overbay and Josh Collmentor both made their first appearances for the D-backs on Sunday, showing mixed results. The oldie showed he's still got some pop, but the rookie pitcher from last year had a poor start as he only pitched three innings and let up six runs, including a two-run jack from Buster Posey. Wade Miley would come into the game to relieve Collmentor, pitching 4 hitless innings. Overbay would then hit a two-run double. A couple of innings later, Ryan Roberts would hit a two-run jack, followed by an Overbay homer. In the bottom of the 7th, Pablo Sandoval and Willie Bloomquist would get into a scuffle as the bases were loaded. Miguel Montero would then hit a blooper to score one run, followed by another Chris Young blooper that scored Aaron Hill as Buster Posey came off home plate to let him score. 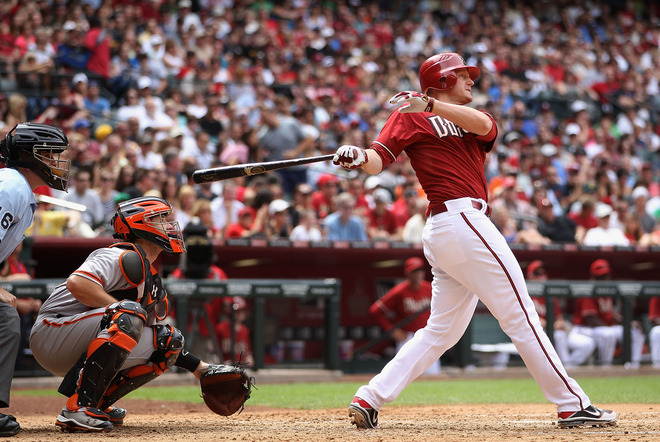 The D-backs would not relinquish their lead, leading to their first come-from-behind victory of the 2012 season.